well this week went by fast. it's been fun, and there are new projects on the horizon that are just so exciting. one of which is personal the others professional. on the personal note mas and i are cooking our way through alice water's the art of simple food. we cook a lot but found ourselves in a rut that caused us to reproduce the same things over and over and over again. this is not for me, i tend to bore very easily. so last night was our fourth escapade in alice's world and the best so far (well actually the celery root mashed potatoes were delicious, but this was better, maybe) and we made spinach lasagna. the simple food version of lasagna entails making tomato sauce, béchamel sauce and pasta ... all from scratch. we make pasta a lot, but i gotta say this recipe was so.much.better than our last. mas has been on a tomato sauce kick so that was easy, and béchamel has been a favorite of ours for a while (though we had never made it). i would recommend it. all of it. on the professional front, well its a secret for the time being, but i'm so excited i can barely contain myself. more on that in a month or so. 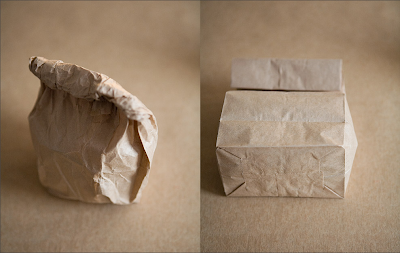 ps- have you seen the 24 lunch bags series on the thussfarell photo site? i kinda love it.